Vitamin D plays an important role in bone health, as well as in immune, nerve, and muscle function. In addition, it may play a role in protecting against cancer, heart disease, stroke, diabetes, autoimmune diseases, and depression. Most children and adults (ages 1 to 70) need 600 IU of Vitamin D per day, though older adults need a bit more. Vitamin D is known as the sunshine vitamin because our bodies can actually make and absorb vitamin D from sun exposure. According to the NIH, 5 – 30 minutes of sun exposure between 10 am and 3 pm twice a week to the face, arms, legs, or back without sunscreen is usually enough to help boost vitamin D intake. This process varies widely depending on the season, time of day, cloud cover, skin color, and sunscreen use, so eating food sources of vitamin D (such as fortiﬁed dairy products, or some mushrooms) is also important. As with all dietary supplements, it’s important to discuss vitamin D supplementation with your healthcare provider, especially if you’re vegan. Your healthcare provider can help you determine how much (if any) supplementation is right for you. Vegans may be at greater risk for low vitamin D intake, but they can obtain vitamin D from regular exposure to sun and fortiﬁed foods. For a more guided look at how to build healthy vegetarian meal plans, check out our Oldways 4-week Vegetarian & Vegan Diet Menu Plan, which will help you create satisfying, balanced, budget-friendly meals inspired by cuisines from diﬀerent cultures. 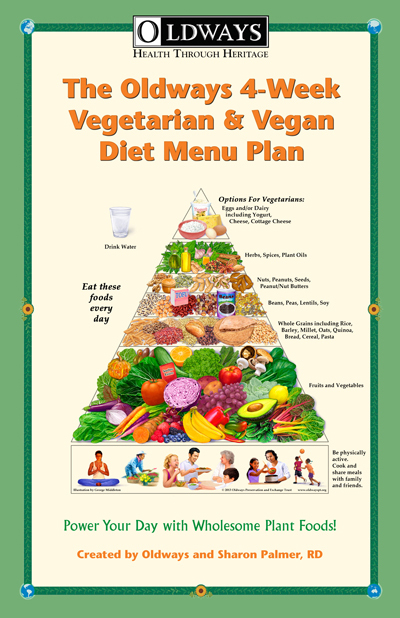 The recipes are based oﬀ of the Vegetarian & Vegan Diet Pyramid and feature an abundance of delicious, healthy foods such as vegetables, fruits, nuts, seeds, whole grains, legumes, herbs, and spices. What does Fortified stand for? Is that separate product? Hi Darshil, thanks for the question! "Fortified" means that a nutrient was added to a food that it originally did not contain or contained in small amounts. So in this case, fortified milk means more vitamin D was added during processing. It's an added bonus because vitamin D helps your body absorb calcium. If you believe in fortified (processed), just take vitamin D pills. If you don't (like me), get it naturally (without fortified). I think, we all have the Sun. So just throw out your kids in the sun to play rather than playing indoor games. Best way to get vitamin D. The problem will only occur for people in north and South of the world which has Sunlight available for only 6 months a year. You don’t get vitamin D from the sun, the sun helps our bodies absorb it. research founds out that people with dark skin dosen't absorb much vitamin d as peo pole with white skin but it is true that all skin color is brown but lighter and darker for diffrent people. What are some trusted vegan brands that offer Vitamin D3 drops or capsules? Hi Charles, We don't recommend one particular supplement or another. We suggest that you speak with your pharmacist, dietitian, or physician to find a trusted brand that is available in your area. My Father is lacking in vitamin-D and we are pure vegetarian family and also he is not able to get sunshine because of his office work. So Is there any alternatives to get Vitamin-D other than medicine? i am also victim of above question raised. pl advise. Hi Jay & Venkat, Many popular foods, such as some milks, cereals, and even orange juice are sometimes fortified with Vitamin D. Check out the list of Vitamin D sources in this blog article for more examples. You can also make an appointment with a registered dietitian in your area, to help build a meal plan that works for you. I agree with you 1010621. And I live in the UK so where am I going to get sun, it's hard enough in the summer let alone the winter. I live in Michigan in the USA, we rarely see sun here during the winter. Winter also stays 6 months out of 12. Actually not everyone absorbs vitamin d thru the sun my skin is a beige/olive tone I spend 2-3hrs in and out of the sun no sunscreen in Arizona and I was still diagnosed with d difficiancy if I don’t take it in vitamin pill form my legs ache and my depression level goes up. Everyone is different. For Thor’s if you looking for a vegan brand try country life it’s available at sprouts and whole foods . I’m deficient in vitamin D. Got put on prescription strength chewable tablets for 8 weeks. My doctor basically said that where I live (central California) and my pigmentation (I am Hispanic) I would never get enough vitamin D even if I were to lie naked outside. This helped me realize how important supplementing with vitamins is. I recently had my blood work done and my dr said I needed 4000 for a month then 2000 after that for the foreseeable future. Why would I suddenly be so low in vitaminD? Hi Ms Hunt, There are many factors that can affect the absorption of nutrients in the body. Your best bet is to talk to your healthcare providers to learn more. I'm curious about this: Exposing mushrooms to UV light causes measurable increases in the vitamin D2 content; amount of vitamin D2 will vary depending on the type of light and duration of exposure. Does this mean that we can buy mushrooms from the grocery store and put them in the sun for a couple of hours and it helps increase the vitamin D levels? Hi Deb, It seems that some people have tried this with some success (https://fungi.com/blogs/articles/place-mushrooms-in-sunlight-to-get-your-vitamin-d) However, since there isn't an easy way to measure the levels at home, we can't really predict what the results would be. Perhaps you could reach out to the brands who sell mushrooms to learn more, and to find out if it is safe to handle their product in that way. Never eat any bakers yeast raw. It will harm your liver. People died during prohibition by eating yeast and drinking an acidic juice turning their livers into "stills". I find it hard to believe that orange is the only fruit to provide vitamin D in a planet filled with a large variety of fruit and vegetables. If u do ur research, ull notice that every site has the same damn list. I guess, I ll just have to do my research on each and every fruit and vegetable available to get the right answer the answer is being biased by money. Agree 100%. Their has to be other options. Fortified orange juice is on this list because it's fortified with Vitamin D. Vitamin D is interesting compared with other vitamins because it is produced endogenously from UV rays. Some mushrooms contain vitamin D if they are exposed to UV light, but not all do. Yes there must be a plant source of vitamin D. Read between the lines plant source all plants use sunlight "D" for photosynthesis. Could there maybe, be a connection between Sunlight, Photosynthesis and Vitamin "D"????????? I cannot believe that- with the very healthy diet I follow, I have just been prescribed 20,000 iu Vit D tablets twice a week. I grow most of my veg ( therefore out in the garden/ allotment) have tan lines on my arms legs and top of my feet- therefore in direct sunlight, I eat lots of fatty fish, eggs, mushrooms etc HOW can I be deficient?? Does higher Intake of Vitamin D damage any part of our body? And Does Vitamin D helps to cure Parathyroid harmony or Lack of Calcium? According to the NIH, excess sun exposure doesn’t result in vitamin D toxicity, but long term intakes above the tolerable upper limit can. Specifically, the NIH website states, “Most reports suggest a toxicity threshold for vitamin D of 10,000 to 40,000 IU/day and serum 25(OH)D levels of 500–600 nmol/L (200–240 ng/mL)” The 2015-2020 Dietary Guidelines recommend that Americans get enough Vitamin D AND enough calcium, so recommend including foods with calcium in your diet as well (such as dairy products or dark green vegetables). Regarding parathyroid harmony, you will need to speak with your doctor about that. My vitamin d3 level is 8.1 Is it too low to recover fast? I'm taking vitanova sachets, is it safe? Hi Ridhi, We recommend that you talk to your doctor for the best advice about your personal Vitamin D levels and supplement choices. There is so much vitamin D in vegan foods ! So why vegan are greater risk to obtain vitamin A ? This really don't make sense ..... I am vegan and all my vitamin level are good. Do grape's have calcium or vitimin D in them ? Hi Sunyhia, Unfortunately not. Grapes have no Vitamin D and only 15mg calcium ( which is only 0.02% of the recommended daily intake). hi..i am 40 yrs old and suggested by physician to take vitamin d capsules once in a week. Does it havE ant side effects.. Like vomiting.. Etc. Hi Lakshmi, We don't produce any supplements, so we can't speak to any potential side effects. We highly recommend that you work with your physician or a dietitian in your area to find a plan that works best for you. Hi Ally, we recommend that you speak with your doctor about your personal Vitamin D levels and symptoms. Hi Maria, We recommend that you talk to your doctor for the best advice about your Vitamin D levels and supplement options. We recommend that you speak to your health care provider about your situation to figure out the best solution for you.